Acoustica Releases Revolutionary Mixcraft 5 Recording Software New Version Brings Professional Audio Features and Video Scoring To Everyone Acoustica has released Mixcraft 5, a powerful new update to their popular Mixcraft recording software. Mixcraft 5 adds video scoring as well as numerous professional audio features, and with an MSRP of US$85.95, Mixcraft 5 is priced at a fraction of the cost of competing products. 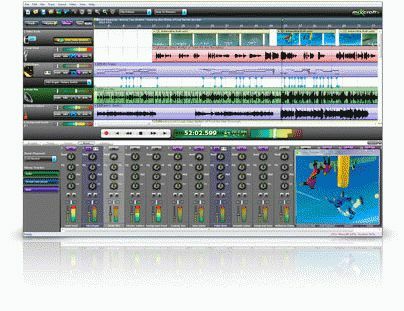 When the fi rst version of Mixcraft was released in 2004, it represented a fundamental shift in the way audio software was designed. Unlike most pro-audio software, which is often bloated with poorly-planned features, Acoustica went to great lengths to ensure that every feature in Mixcraft was intuitive and easy-to-use. The result was a well-crafted, elegant recording package that didn’t require a manual, and it quickly gained a following. In the years since, Mixcraft has evolved into a powerful audio and MIDI studio, with a wide variety of virtual instruments and effects, and a huge collection of professional audio loops. Critics have praised Mixcraft’s clear, attractive design and fantastic sound quality, and customers have applauded its musician-friendly low price. As Mixcraft has become increasingly more powerful, Acoustica has continued to work hard to keep the price low and the interface simple and fun. Mixcraft 5 takes the Mixcraft concept farther than it’s ever gone before. Acoustica has added pro-audio features never before seen in software at this price, all without cluttering up Mixcraft’s easy-to-navigate interface. look at music software the same way again.